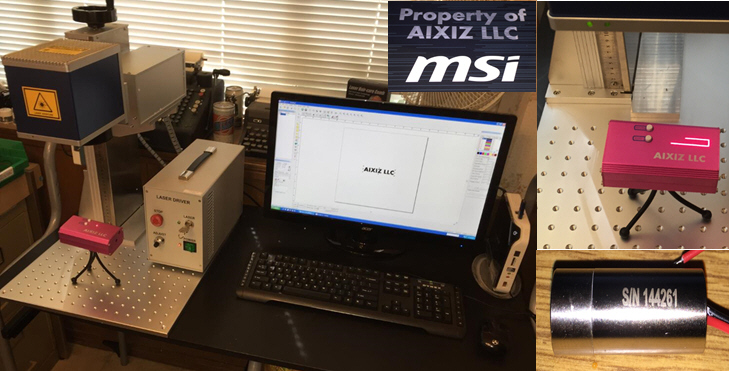 AixiZ desktop 30 watt Fiber-optic laser engraver, very flexible and is easily integrated into industrial production processing. Using EZ CAD software, operation is intuitive and simple for any operator. The laser is controlled by a USB interface. All purchases come with one day of on-site technicial installation and training, 2 pair of laser safety glasses, pre-loaded EZ CAD operating computer and test marking cards. Average laser output power 30W(Continual or Pulse). Laser wavelength 1064nm. Power adjustment range 10-100% Repetition frequency 20-100KHz Output beam quality ＜1.5M² Marking Linear deep ≤1.2mm. Min. Highlight spot 0.005mm. Min. character size high 0.15mm. Repetition accuracy ±0.001mm. Max. Linear marking speed 12000mm/s. Marking format Graphics, character, bar code, two-dimensional code, date, serial number. Software WINXP + support file formats of PLT, PCX, DXF, BMP etc; SHX and TTF fonts. Electrical demand 90-240VAC ±10%/60Hz/4A. Cooling Mode Air-cooled. Control interface USB Laser module life ＞10000 hours. Laser IPG Resonance mirror High speed. Note shipping is concurrent with on-site installation and training (mandatory) with a lead time of six weeks after receipt of order.